Yesterday was a busy day for me, after spending the entire day at a netball carnival with my daughter, then taking my boys to tennis after school, I was very tempted to come home and reheat a stew I had in the refrigerator. But I didn't feel like eating that. As I knew I was going to be busy, I had shopped the day before for 2 days of cooking so I had all the ingredients for the curry at home. Reheat a stew or cook the curry, I chose the curry. Was my family happy about that decision, oh yes. This is so easy and quick to make, my 30 minute meal, even when you are exhausted it can be done with little effort. While your rice is cooking in the rice cooker, you get the curry ready. That easy. I remember watching a cooking show where they don't consider using a curry paste from a jar as real cooking, in my house that is perfectly fine (especially on busy days). One tip I'll give you that I learnt is to save leftover curry paste from getting mould growing on it, smooth over the top of the curry paste left in the jar, then carefully pour over some vegetable oil to cover the surface of the curry paste, place on the lid, refrigerate and it stays fresh. Heat your wok until hot. Add a teaspoon of the oil and 1/4 of the chicken. Stir fry for 2 minutes. Remove chicken from the wok into a bowl. Continue with adding oil and chicken in batches, until it is all cooked. Reduce the heat to medium-high, add a teaspoon more oil, add the onion and stir fry for 1-2 minutes, or until the onion begins to soften. Add the curry paste, stir it around for 30 seconds. This is why you don't shake the coconut milk tin. You now need to only add the thick top part of the coconut milk. Stir it around for 1 minute or until it starts to split, then add the remaining coconut milk from the tin, bring to the boil. Add the chicken and juices from the bowl back to the wok, stir it around, reduce the heat to low and simmer for 10 minutes, or until the chicken is cooked through. Add the lime juice, palm sugar and fish sauce to the wok, stir. Add the spinach leaves, mix them through. Remove from the heat. Add the bean sprouts and if you like some coriander leaves, stir through the curry. 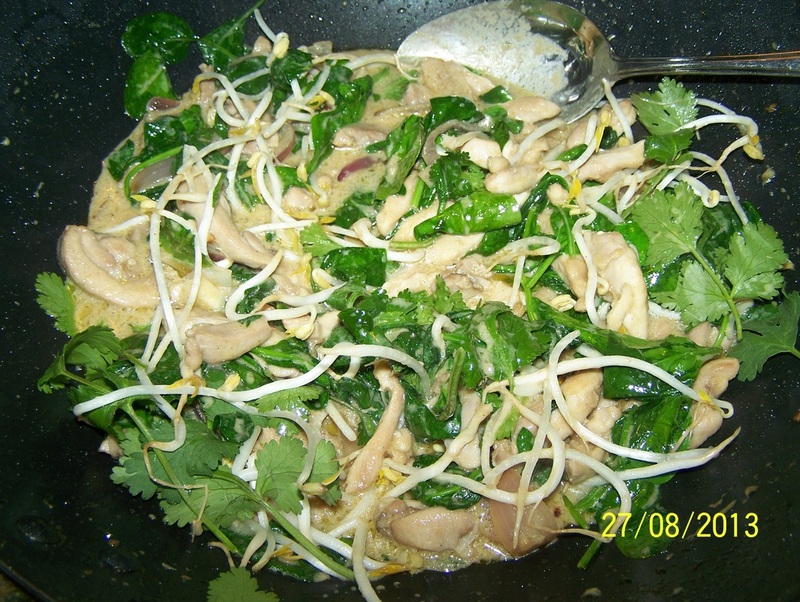 Add some extra bean sprouts and coriander leaves in bowls at the table for anyone that likes to add more. Serve with cooked rice.